We happened to have an old door on its way to the Habitat Homestore. What a good time for a demonstration! If you don't have sawhorses, two straight-backed chairs make level supports for an impromptu buffet table. I covered this door with a length of indigo cotton from Goodwill. Chairs around the table would completely hide its humble beginning. Meredith- You're up early!! And I am, too, because of a feverish, sick baby!! I love this idea, and it looks like the beginnings of a fun, alfresco event. Does that tablecloth match your dishes? Did you buy it at the same time as your dishes? This is OLD news of coarse but for years I have used a door and two file cabinets as a sewing surface. The file drawers are wonderful for holding patterns etc. The hole in the door is perfect for the cord of my sewing machines. I like that the door is long enough for my two machines to sit side by side. Makes sewing a snap...I have both a sewing machine and a serger machine. The file drawers hold patterns, machine books, and the extra parts. It has just worked out to be a good system for my sewing room. 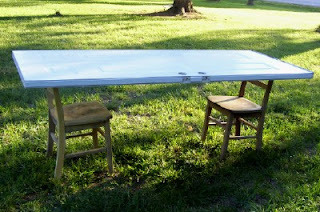 I love this idea and we actually use one of these "tables" as a craft area for myself in our basement. It had been left with us from the previous owners and I use it as a craft table and a wrapping table during the Christmas season!! 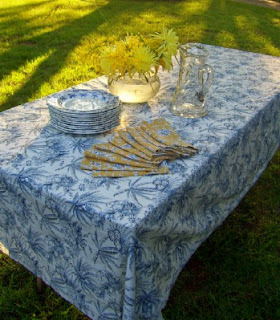 I love the table linens- great find! You totally just gave me the OOMPH to go to Goodwill for fabric for tableclothes! Love the design, totally sharing with friends and WOW! THANKS! I love the Goodwill. I found a wonderful curtain for my Kitchen last time I went and it only cost $2. It was white, with what looks like crocheting around it. Can't wait to get it up. I have to say I really enjoy your blog. It is so inspiring and uplifting. 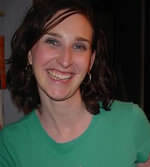 Glad other women who are finding joy in homemaking. beautiful! we have done the same type of creative furnishings. what i want to know is how you have time with 2 kids to put together such a beautiful demo for our benefit!? Nea, my kids were running around in the yard enjoying the sunshine while I set up the table. Then they asked, "Where's the party?"